Solid Edge Learning is the critical constant in the equation for your success. Succeeding in an increasingly competitive world depends upon results. Prosper by focusing on your end goal, your destination, or be punished by unnecessary distractions on your journey. Don't waste your precious time struggling to master the tools that help you with your assignments but concentrate on the assignments themselves. It is your ideas, designs, and creations that are of the most importance. Use Solid Edge Learning to help you master Solid Edge in record time and solve your equation for success. You'll have access to hundreds of Solid Edge Tutorials, Solid Edge Tips & Tricks, and Solid Edge Training Videos. There is a huge archive of Solid Edge Questions & Answers and expert information and advice, plus a community of Solid Edge users in education. Available on-line 24/7. All content within the membership area of Solid Edge Learning is provided in collaboration with Solid Mastermind. The duration of the sponsored membership is one year, but can be extended with a re-registration. Pay a recurring monthly fee for access. You can hang around as long as need and then easily cancel when no longer required. All for less than the price of a good textbook. The Solid Edge student grant program enables students, of all ages, to use Solid Edge in support of their studies for free. At their sole discretion Siemens PLM Software will provide the Solid Edge Student Edition to any active student, teacher or lecturer attending academic institutions such as accredited universities, technical colleges, trade and high schools. The duration of the software license is one year, but can be extended with a re-registration. The Solid Edge Academic Program offers accredited schools, colleges and universities a comprehensive family of modular, integrated PLM technology that helps deliver the quality education required for the needs of today’s students. 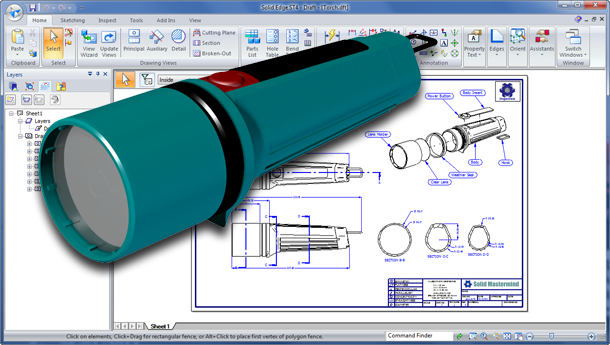 The Solid Edge University Edition includes more capability than the Student Edition and is perfect for a site-wide implementation. ...and here are some other social media resources courtesy of Solid Mastermind.